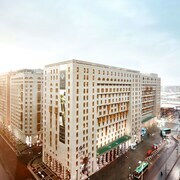 Located in the heart of Medina, this luxury hotel is within a 10-minute walk of Al Haram and Prophet's Mosque. Bin Dawood is 0.9 mi (1.5 km) away. 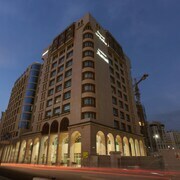 Situated in Medina, this luxury hotel is steps away from Bin Dawood and Al Haram. Prophet's Mosque is 0.6 mi (1 km) away. Situated in Medina, this hotel is within a 10-minute walk of Al Haram and Bin Dawood. Prophet's Mosque is 0.8 mi (1.3 km) away. 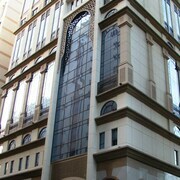 Situated in Medina, this hotel is within a 5-minute walk of Al Haram and Bin Dawood. Prophet's Mosque and Baqi Cemetery are also within 1 mi (2 km). Excellent stay in April 2019, we arrived early morning at 6am from madina airport, our room was booked from 3pm but we we got our room early at 8am. Excellent service from the bell boys. Our room was cleaned regularly, and any information we needed or help was provided. Room was good size. Very very close to mosque. About 12 elevators so no problems around prayer time. Supermarket bin dawood in basement for all needs. Excellent. Will definitely book again if have chance. The room cleaners were all good lads. Jazakallah for treating our family as your family. Upscale-minded travellers enjoy visiting Medina though all visitors are sure to find something to appreciate. Tourists can also enjoy the city's sightseeing tours, archaeological sites and cafes.